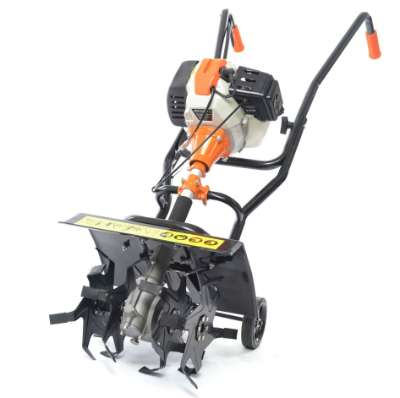 Rather similar to electric tillers, in their compact and easy to manoeuvre shape and size, these tillers are either 2-stroke or mini 4-stroke petrol machines, suitable for small to medium plots and vegetable patches. Again, they are easy to work with and can be negotiated between rows, in narrow and confined outdoor spaces, with none of the disadvantages of electric tillers – no cables to become snagged or limit the distance at which you can carry out your work. This makes them suitable for those with vegetable plots further down the garden or possibly those with smaller allotment plots.